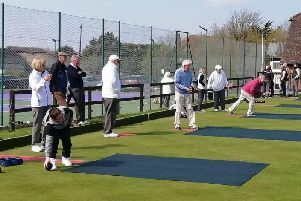 Bognor started strongly - and continued in the same vein - when they faced Tottonians seconds in the last home game of the season for the men in green. Nathan Archer and Jacob Masters began brilliantly in the loose with some strong carrying and savage tackling. The first try came from student Jake Aldis-Hobbs, who was put through a lovely hole by Dave Sweeney - and it was 7-0 after a coneversion. Tom Orchard and James Barlow were paired together again in the second row and are improving each week, the two making inroads with ball in hand and hitting their fair share of rucks. Try number two came from another lovely Archer break out wide, the No7 stepping past his opposite man to feed Chris Hay. The youngster drew the man and gave it to Dan Robinson who scored. Bognor were firing on all cylinders and the likes of Lee Mason and George Hutchinson were causing havoc at scrum time. The forwards led by George Castleton were ferocious all game. Next up was the second best try of the game and a flash of brilliance from a future Bognor star. Connor Herrington, starting at scrum half, saw a tiny gap beside a ruck and decided to weave his way past four opposition men and dot down after a 50m sprint race; impressive stuff on debut from the youngster to make it 19-0. Just once were Bognor caught napping, Tottonians played a lovely kick through that was gathered well by their winger. Another colt got on the scoresheet for Bognor at the start of the second half, and great build up play from Pat Gains and Alex Bosley saw rapid winger Lewis Decarteret go over in the corner after a lovely step in the wide channel. An excellent kick from the touchline by Sweeney made it 26-7. Totts couldn’t handle the pressure put on them by Bognor’s forwards and the great hands on show from Sweeney and his backline. James Barlow was next to bag a score, finishing from close range. Substitute Freddie Hayes was the kindling that kept the Bognor fire roaring, the colt making his debut for the first team stepped past five men and ran a score in from 80m. What a bright future lies ahead for the Hampshire Avenue faithful, seeing the try of the season so far make it 36-7. Barlow scored again from close range and looked delighted with his ten-point haul. Graham Broome was putting himself about and made a gorgeous tackle on the touchline, and the ball was turned over by the immense Masters and spun out on the angle to Hayes again, the debutant feeding Chris Hay who finished for a well-deserved try. Last but not least was a score from the very impressive Paddy Burnett, the Irishman scoring a naughty try after some perfect support running. The winger is currently tied with Balchin’s impressive & long standing record of 26 tries in a season and will want to beat it next week at Milbrook. It ended 57-7 after a Sweeney nudge. All in all it was a wonderful day for the first team despite missing some experienced and quality players.